Kazimierz Łaski was Director of Research at wiiw from 1991 to 1996 and Senior Research Associate until his death, 20th October 2015. He was acknowledged internationally as one of the most important representatives of Post-Keynesian economics. 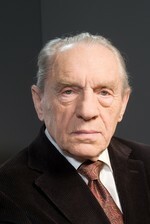 Prof. Łaski was born in Warsaw in 1921. He studied economics and graduated in 1954. He was a student and close collaborator of Michal Kałecki, the British-Polish economist. Łaski had to leave Poland in November 1968, driven out by the anti-Semitic campaign of that era, and lived in Austria ever since. He was Professor of Economics at the ‘Johannes Kepler Universität’ in Linz from 1971 to 1991, where he played an important role in the development of the economics curriculum. From 1991 to 1996 he was Director of Research at wiiw and thereafter Senior Research Associate. He participated actively in the work of the institute until his death. After 1990 Prof. Łaski worked intensively on the economics of transformation of the former planned economies. His critical assessment of the economic policies in these countries that were, at the time, very much dominated by the thinking of the Washington Consensus, proved to be right. It was appreciated only at a much later date. During his tenure at wiiw he was able to develop the institute into a research centre on the economies of Central and Eastern Europe with an international standing.